The attached code implements another strategy to generate complex shapes. It avoids boolean operations, and thus can speed up shape generation by a factor of 1000-10 000 times, reducing rendering times from hours to seconds. The code is work-in-progress, and as such is likely to contain bugs. Please feel free to tell me. 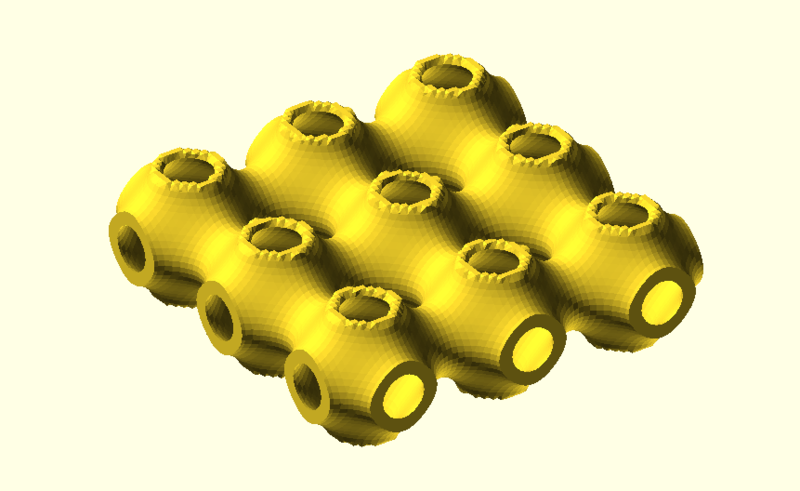 It has been developed using OpenSCAD 15.3. The code is based upon the idea that polyhedron(vertexlist,facelist) needs two lists to create any possible shape. The list of vertices is user defined, and from this list the list of faces is automatically generated. To do so, the shape-to-be-generated is built up of a list of vertices, called a slice, having the same z coordinate. These slices are then stacked one on top of the other, by concatenating the lists of slices into a single vertex list and changing the z coordinate, to generate the shape. Since changing the z coordinate amounts to moving the slices around in space, this is the time to change the x and y coordinates as well, implementing a shearing action. This is as far as the code presented goes. Language use: implementing rotations and translations using lists of vertices differs substantially from rotating and translating shapes. To do so in OpenSCAD, functions have to be nested one in another, making for code that is difficult to read and maintain. Thus, I replace rotating and translating with tilting and moving, as an outside recognition that the words carry the same meaning only insofar their effects on the outside (i.e. on the eventual shape) are concerned. The inside effects (i.e. on how the code is designed to obtain the desired results) are very different. Tilting the slices has so far not been implemented: Tilting the slices in space is more demanding, since unless the tilting axes are carefully chosen, the resulting shape will be unrecognizably distorted. For both runs, the cache has been flushed beforehand. into a very general solution. Also this works astoundingly well, the solution completely ignores the wicked self intersection problem, by leaving all burden to the user. It executes amazingly fast for the price that it can not be formalized into a general pattern without a lot of effort (also in time). restrict the (simple) polygons to be convex, which is a strong restriction and even then you will have to employ some intelligent scheme for triangulation between the layers (see skin()). In my eyes, a first generalization step for language integration could be to allow for a linear_extrude() with a height or/and a scale vector (or a user-defined function) describing the Z coordinates and the scale of the slices. Maybe also twisting could be done this way. Any *bending or rotation* will introduce non-linearity and a hole bunch of self-intersection issues. Another much easier approach could be an operator that just piles a set of 3D-shapes on top (or aside) of each other using the first one (or z=0) as base. This will avoid the intersection and union problem by definition and all knitting can be done before entering CGAL. 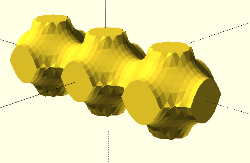 See this example (which is kept in 2D, because z-coordinate of a 3D shape cannot be quested in current OpenSCAD to grand for non-interscection). As you may see, the function and the module let to the user the burden of triangulating the non-triangular faces of the polyhedron. And, as Parkingbot pointed out, it doesn't check for self-intersections that is hard to implement and process. Finally if the polyhedron data doesn't define a manifold, the deformed object will not be acceptable by CGAL. Except for the increase in speed, my approach also does away with the need to have a faces list. A few extra brackets in the VertexList is all it takes for the computer to be able to generate the faces list by itself. But it also exposes shortcomings in the language: nested lists can currently be read only one level deep, and thus I was forced to develop, with function ExtractSlice, the ability to access deeper nesting levels. The current implementation has only two nesting levels and thus cannot handle holes. By adding a third nesting level, I expect that holes can also be accomodated. Vertices, innermost nesting level, contains a list of numbers to define a vertex. Slices, second nesting level, contains the list of all vertices belonging to a slice. Groups of slices, third nesting level: counting from the outside, the first slice represents material, the second a hole, the third material, etc. That this works will have to be demonstrated, though. Thanks, Ronaldo, for pointing out that my approach is not quite new. Were you aware of the gains in rendering speed that are achieved using this approach over the more conventional approach of using unions() or hulls()? Or that the faces list can be computer generated and need not be provided by the user? Parkinbot, I have difficulties understanding what you mean: what properties does a polygon need to have that you will call it simple? Can you explain? Self-intersection is not a problem for me, as I design by eye, and my eye will pick up any funny shapes immediately. 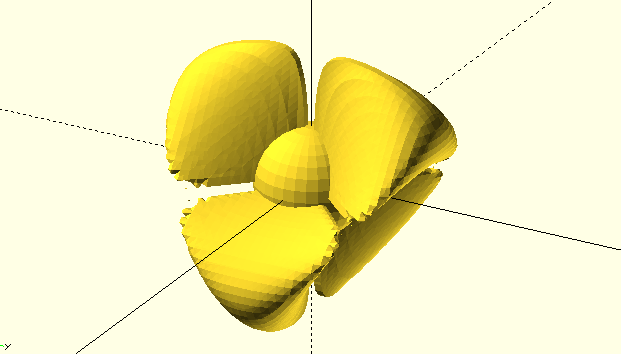 Whether self-intersection is a problem with CGAL remains to be seen, as at some stage I will have to try to design a Klein bottle in OpenSCAD. If CGAL is true to its mathematical roots, then I do not foresee any problem in constructing the bottle, nor do I foresee restrictions regarding convex or concave slices. Lastly, what do you mean with "because z-coordinate of a 3D shape cannot be quested in current OpenSCAD to grand for non-interscection" With "quested" I suppose you wanted to write "queried", but what in a Palainian hell is "to grand" supposed to mean? Sorry about the 'typos' (English is not my first language). Of course I meant „queried” and „ensure/guarantee“. I perfectly agree with you: If you know what you do (self-restriction), avoiding superfluous tests is a perfect way to get fast results. But I can assure you: Self-intersection *is* a problem with CGAL - and dealing formally with it is the main reason why CGAL is slow. A general scheme or a language feature cannot rely on self-restriction (e.g. pointers in C language follow this way, and we all know, what was the result in the history of computing). About "simple polygons" and "convexity" you can find good articles in the net, e.g. Wikipedia. We also had some discussion on it in this forum. The slowness of the hull-approach is obvious and mainly comes from the large number of union() operations being involved. 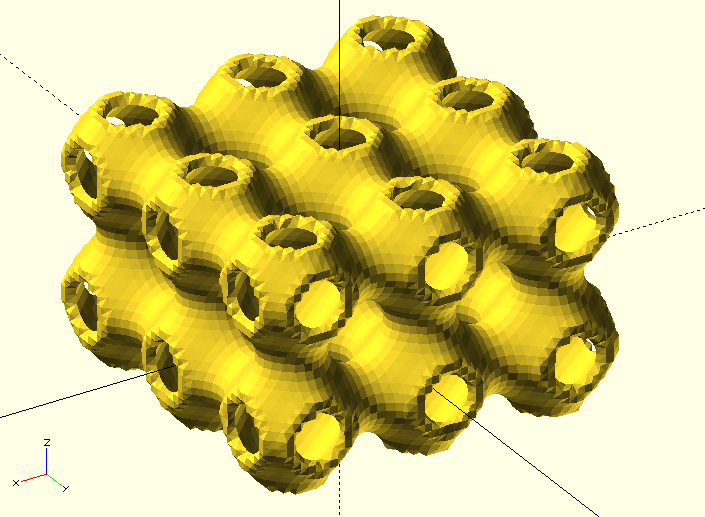 But it is still the only way to tackle things like that with OpenSCAD language means (and was discussed e.g. here). Also my next step was to switch to polyhedron(), which means you are programming the whole shape mostly from the scratch - and nobody will understand your code anymore, unless you put it into a well-documented library with a simple interface like skin(). you get in trouble. To find what caused the trouble may be a greater trouble. approach over the more conventional approach of using unions() or hulls()? Your slice approach to the spring modelling is the same of Oskar Linde's sweep that encloses all the face list computations. A more general construction is his skin that do the same. I have been using a similar more general approach to model solids enclosed by Bezier surfaces and "almost" planar faces. All face lists computation are inside a general module that process the user meshes. It works provided that the surface patches created by the user meet at boundaries and define a manifold. And that they have no SI! So, a lot of care is left to user. However, I don't see any approach that effectively avoid non-manifolds created by users. 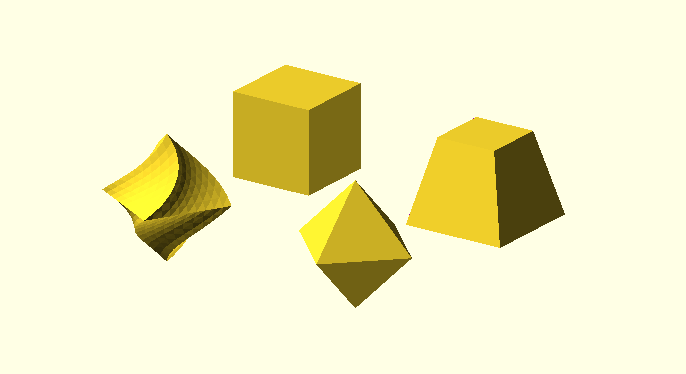 With OpenSCAD union, you may build a non-manifold with two cubes having only one vertex in common. Or intersecting to cubes with just one face in common. But I agree that those are simpler to understand and avoidable than other cases. The only approach I know that deals well and naturally with SI is f-rep (implicit representation). If carefully implemented it may "makeup" all model singulaties. where the surface was unioned with a OpenSCAD sphere. It is a crude representation of a yet rudimentary (but large and complex) f-rep processing code. The gaps you see are the natural "makeup" of the SI the surface has. Bounding boxes would help here. 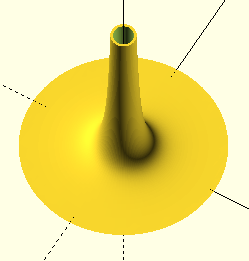 The refinement problem reminds me on my first attempt to render some Schwarz p surfaces. The most famous one almost looks like the OpenSCAD logo. Here you have it in my interpretation. The process generated 64984 triangles with 91958 vertices and required 9min and 20sec to render. this looks good and shows that your Frep-stuff is working well, besides that it could profit from some (implicit) grid refining scheme near the borders. Ok, you use the triple cosine shortcut instead of the minimal surface calculation, but this is another theme. To be able to print it, one would also like to have a skin extruded structure, which was the point where my effort (and time) ended. BTW, I used an ordinary R²->R function plot after resolving the implict equation to z and discretrizing it over a domain restricted to the partial symmetry. While this gives you a nice border around the top hole, you can use union operations to repeat the rendered chuck for all symmetries with the required orientation. Kudos to you, Parkinbot! What would we do without people like you! > it could profit from some (implicit) grid refining scheme near the borders. > calculation, but this is another theme. > structure, which was the point where my effort (and time) ended. Jon, we are talking about explicitly rendering shapes and rendering speed of the polyhedron approach. Sorry, if that gets boring for you. this looks good and shows that your Frep-stuff is working well, besides that it could profit from some (implicit) grid refining scheme near the borders. Yes, the borders are a lot rough. I did not implemented any feature detection scheme. They are a lot harder to implement. A local refining scheme would improve the edges but they would be rough anyway. Ok, you use the triple cosine shortcut instead of the minimal surface calculation, but this is another theme. I used the approximation I found in Wikipedia. I am not acquainted to the minimal surface theory and have not found any exact implicit form of the surface. The upper image represents just the surface and it is not a manyfold. It was obtained by commenting 4 lines of the f_mesh_evaluation code eliminating the six bounding box of the mesh. So, the inside surface was obtained just by doing an "offset" of the original function value and the min() is equivalent to an intersection. That is one of the marvelous things of the implicit representation of f-reps. I have no idea of what you are saying here. But I tip my hat to you. @jon, I could not say it better. One more point: Rudolf, who I suppose is German, referred to a minimal surface created by Schwartz, who I suppose is German too. 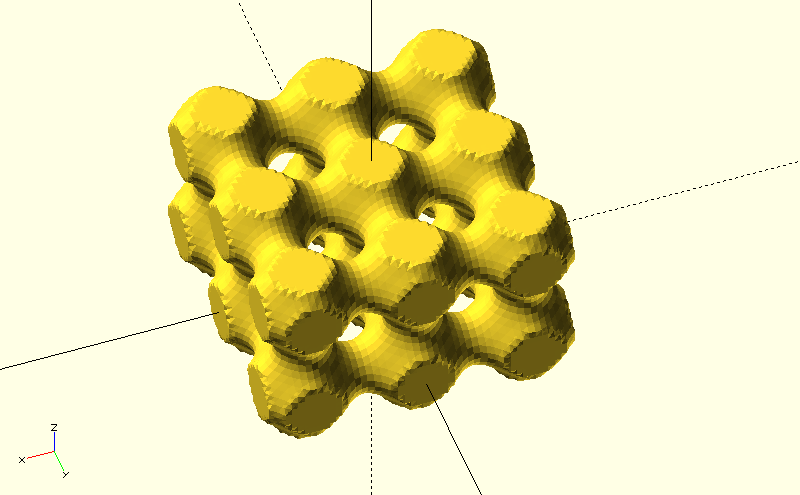 I would like to render a minimal surface created by a Brazilian mathematician (I am a Brazilian too): the Costa surface. But I have not found any implicit form of it. If someone give me a reference for that I would be very grateful. scheme would improve the edges but they would be rough anyway. six bounding box of the mesh. is one of the marvelous things of the implicit representation of f-reps.
are doing. As I said, Kudos! > the polyhedron approach. Sorry, if that gets boring for you. thanks again, for showing how mighty your approach is. 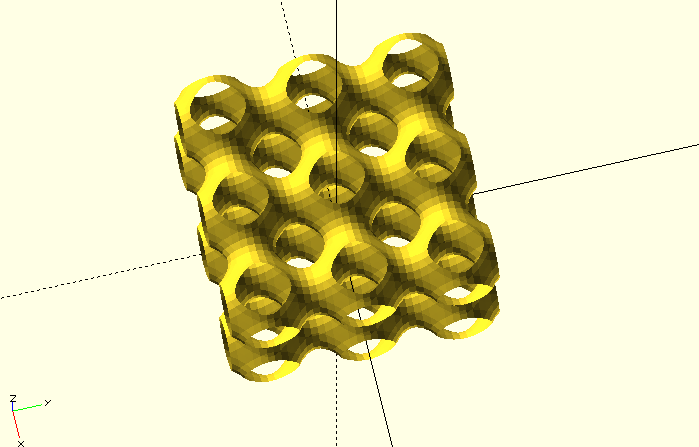 I tried to dig out my code on that, but found only my first approach, which I did in OpenSCAD. I think I changed to Matlab after that. I remember there was a point, I got frustrated on calculating the skin part - in which your approach seems to be very good. and then solve this system for any (feasible) z-discretrization, while restricting x and y (out of R²) to the symmetry region (shown by the lines in linked picture). Not such a big deal. yes, this is indeed marvelous. I'll have to dig into that one day. Hermann Schwarz was a German mathematican. Can't help you with Costa ... Surface math is not my world by the way. For easy comparison, I have left the top and bottom surfaces uncut. I have refined the mesh a lot this time: it has 140000 points. The final model has 43000 polygons, subdivided in 137000 triangles with a total of 197000 vertices. It took 38min to render. Well done. Now you see that it is not harmonic. The minimal surface connects with circles. But I'll vote for it to get the logo of multithreaded OpenSCAD. I could not display the video with the online software but it can be downloaded to be played offline. 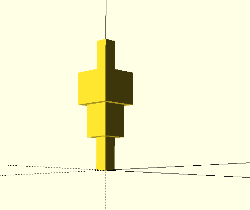 The animation loosely suggests that an OpenSCAD model is made of the combination of small parts.